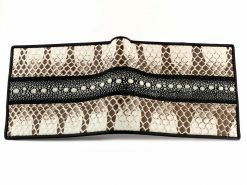 Highly sought after is this Eagle Ray sting ray wallet with an intriguing “row of pearls” through the center. The central band of “pearls” is made by sanding down the row of protective spines found running down the stingray’s back and tail. 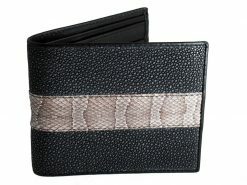 Suitable for any social situation or style, making one of the most popular mens wallets on the market. 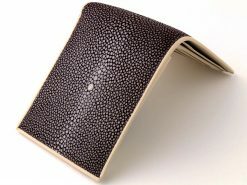 Often refereed to as the jewel of the sea, sting ray leather has been used for centuries in Asian cultures where it is thought to hold magical properties for those who use it. Now its in your hands, get lucky… get a Real Mens Wallet. 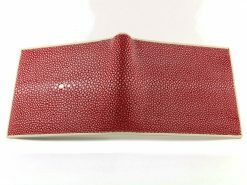 I purchased this Eagle Ray wallet several years ago. It is my everyday wallet and although I carry it every day it is still in perfect condition. Ray skin is entirely armored on the outside with dermal denticles “tiny skin teeth”. 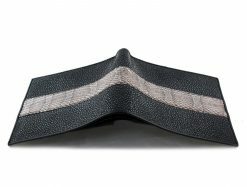 This makes the outside of the wallet very hard and durable and yet it’s totally pliable. As such it really doesn’t look like this wallet will ever wear out. Another factor that doesn’t show up in the photos is the beautiful reflective properties of ray skin, it’s almost like it’s covered in tiny gem stones. This is an exceptional wallet by any standards and I’d give it ten stars if that were an option. Service was great, my wallet arrived in a timely fashion and I couldn’t be happier. 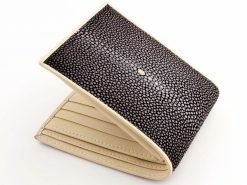 I originally ordered a different wallet and changed my mind shortly afterwards for the Eagle Ray wallet. I contacted Xavier who changed my order and processed a refund to Paypal. Great service! The wallet arrived in good time and I am impressed. 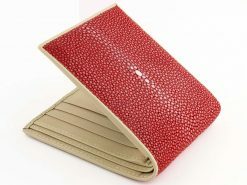 The workmanship and materials are first class; I have $400 crocodile wallet that is not finished as well. All in all an excellent experience and highly recommended. Just received my wallets in the mail and they are amazing. 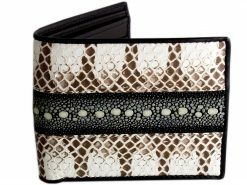 The pearl row stingray wallet is simply stunning, while the shark/ray wallet is a wonderful design with multiple textures. I couldn’t be happier with my purchase. Thank you very much!